Fishers Island Oyster Farm’s innovative ocean-based suspension grow-out system produces oysters with incredibly vibrant and clean flavor. There are many techniques used to grow out oysters, and we employ one of the most efficient and environmentally-conscious forms. Of the 40 million oyster seed that are raised in the nursery, we keep just a small amount for ourselves to grow out. 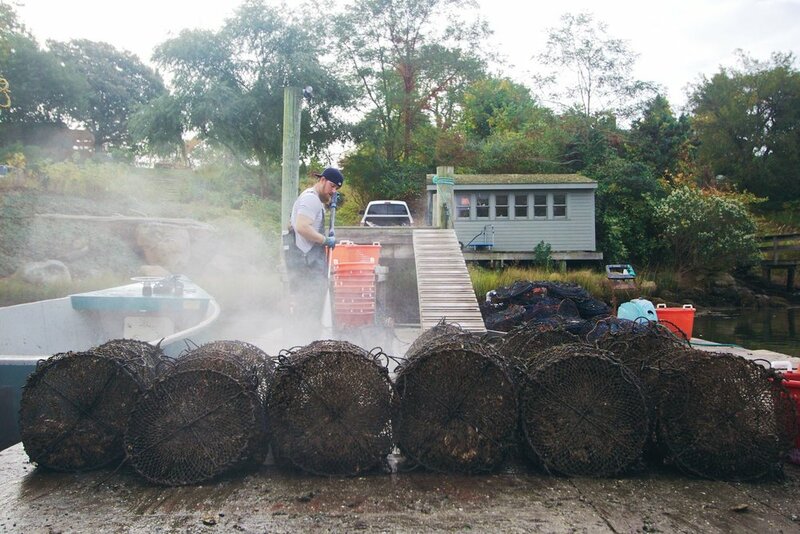 The majority of the seed will be sold to other oyster farmers in the Northeast. The conditions on a grow out site can greatly influence the taste, texture, and even appearance of an oyster. We are always amazed at how differently our seed oysters turn out at other grow out sites along the coast. Our final grow out site is located in West Harbor, on the north side of Fishers Island. A great benefit of this site is having the high volume of pristine Block Island Sound water flow, which helps usher in ample amounts of food for the oysters. This breathtakingly beautiful bay is home to an abundance of life: from the eelgrass and schools of juvenile fish that thrive freely below our oysters to the curious cormorants and seals that look on as we work the nets. By using buoy lines of suspended nets and a hand-operated process, we can farm our oysters without disrupting the existing ecosystem as well as provide a living structure around which other organisms can safely thrive. Building off of the pearl net idea from year one, we use larger lantern nets for the second and final year of culture. These accordion-shaped net bags consist of five compartments, with each tier holding one hundred oysters. Our lantern nets hang from long lines supported by heavy duty buoys. 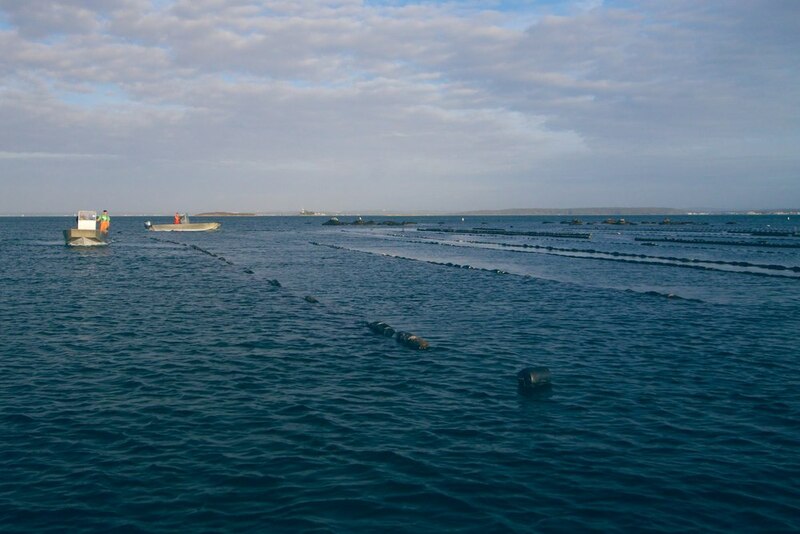 From June through the middle of November, we handle each net three or four times in order to keep them free of the seaweed and marine invertebrates that would otherwise reduce the circulation of water for the oysters. This labor intensive process is accomplished all by hand, along with the transporting assistance from a couple small skiffs. Another great benefit of our farming site and method is that our nets act as a natural inventory system. So instead of storing our to-market oysters (3-3.5 inches) in a cooler or refrigerator, we hold them in the sea until the day they are packed. Every morning, the crew sets out into the bay to harvest the day's order. Before they are taken in to be quality checked, they receive one last cleaning to ensure that they are free of mud. Each oyster is assessed, sorted, counted, and put into insulated boxes by hand. 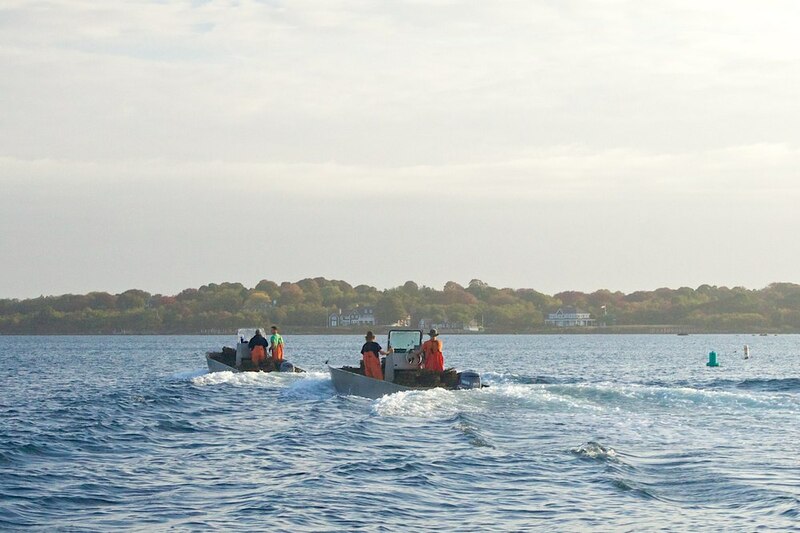 Every afternoon, the freshly harvested oysters make their way from Fishers Island to the mainland, where they are shipped for next day delivery. Our efficient, on-demand harvesting process ensures that our oysters will arrive to you within 36 hours of leaving the water.